← Guest Post: Why Scott H. Loves Climbing. Ed. note: I am not a physical therapist, doctor, scientist, or astronaut. I am a rock climber who’s been paying attention to the different ways I hurt and fix myself for more than a decade. If you’re experiencing pain, you should probably talk to a doctor, not a blog. Tendinitis is one of the most common injuries climbers face (other than scraped knees and bruised egos). Do you get forearm pump during a hard climbing session? What do you do for those muscles after your workout? Just like stretching can relax cramped or tired muscles, the muscles and tendons in your forearms need some love too. Take a minute and do this quick stretch. You can do it at your desk, before you rope up, first things in the morning – whenever. Extend your right arm in front of you, point your fingers at the ceiling, and use your left hand to pull them towards you. Feels good, right? Especially if you’ve just finished a climbing session. Now point your fingertips at the floor and pull your hand towards you, so you’re stretching the muscles in the top of your arm. Ouch, right? Odds are these muscles don’t get nearly enough love – especially if you spend all day at a computer. Using your opposite hand to massage out those muscles may feel good (and I do this sometimes too), but think about it – if I’m massaging my left arm with my right hand, it means I’m using the muscles in my right forearm. That’s rather counter-intuitive (although it feels really good, in an ouch-it’s-good-for-me kind of way). So what’s a climber to do? I’m not a physical therapist, but Kelly Starret is, and he has some great suggestions for loosening up (“mobilizing”) your forearms. Proper forearm mobility can help with wrist and elbow range of motion, and can cut down on your risk of tendinitis. Here’s your challenge – every day this week, take five minutes to work the kinks out of your arms. Even if you don’t have an Armaid or a lacrosse ball handy, take some time to feel the tightness in your muscles and work it out. Go on, give ’em a good stretch. And in a week, check in with yourself and see how you feel, and let us know! What’s your favorite forearm stretch? How do you “fight the pump”? Do you own an Armaid? (I’ve been flirting with the idea of buying one but haven’t pulled the trigger yet.) Share your secrets so we can all feel as good as you do! 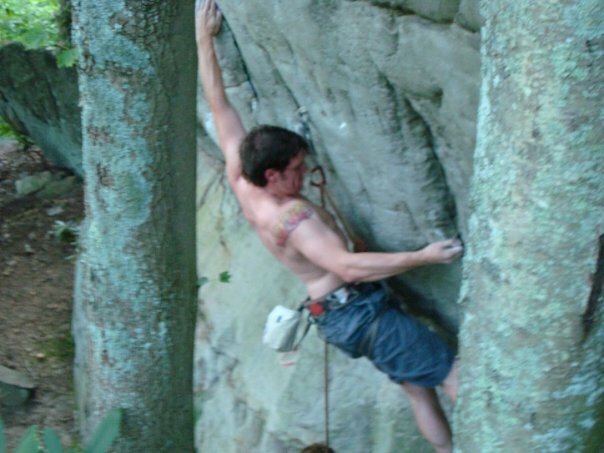 This entry was posted in Indoor Climbing, Wellness and tagged forearms, workout. Bookmark the permalink.